Gov. Butch Otter delivering his State of the State address on Monday. EdNews photo by Andrew Reed. Describing education as the state’s most pressing priority, Gov. Butch Otter on Monday called for increasing K-12 spending by 7.9 percent next year. In connection with his annual State of the State address, Otter laid out a series of budget recommendations that called for increasing public school funding by $116.6 million. While Otter called for bumping school spending by 7.9 percent, he proposed increasing overall general funding spending by a slightly smaller clip — 7.3 percent. His total budget lays out $3.29 billion in general fund spending recommendations. “We made promises during the Great Recession that we are duty-bound to fulfill,” Otter said. “We have priorities for Idaho’s future that require world-class K-12 schools and an advanced, responsive postsecondary education system. “And, now, we have the financial means,” Otter continued. In the fall, Superintendent of Public Instruction Sherri Ybarra recommended increasing public school spending by 7.5 percent, or $110 million. Otter’s budget recommendation would increase K-12 spending by $116.6 million. One of the major initiatives Otter rolled out during his speech was a literacy proficiency program designed to improve the reading skills of students in kindergarten through third grade. On the higher education front, Otter proposed a “tuition lock” program, which would ensure tuition rates Idaho college students pay as freshmen would remain unchanged throughout four years of college. Students participating in the program would have to meet GPA requirements that would be established by the State Board of Education, Otter’s aides said. Otter delivered an optimistic, 35-minute speech that was interrupted for applause more than 15 times. The first half of his speech was dominated by education themes and calls to improve student success. $39.9 million more to pay for the second year of funding for the career ladder teacher salary law approved in 2015. $10.7 million to launch his new literacy proficiency program. 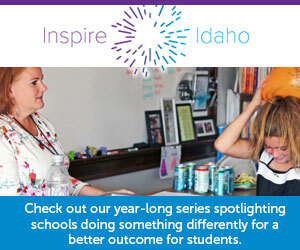 The program would provide funding to pay for optional full-day kindergarten for students who score below “basic” on the Idaho Reading Indicator. It would also provide interventions for other students who post low scores on the IRI test. $5 million in ongoing funding for teacher professional development training geared around mentoring new teachers. $30 million earmarked for discretionary funding — sometimes called operations funding — to restore recession era cuts. The new funding would bring per-classroom spending levels back to $25,696 a piece, the same level reached in the 2008-09 school year before steep budgets cuts were implemented. $5 million for college and career advising designed to help increase the number of young adults who earn college degrees or certificates. $10 million for classroom technology. $1.1 million to develop a mastery-based system of education in up to 20 school districts. In 2013, Otter’s Task Force for Improving Education recommended the state adopt a mastery-based system of learning that no longer relies on a students spending one year in a given grade level before moving on. $2.5 million to assist districts that experience enrollment growth throughout the school year. $2.2 million for WiFi internet services. $2 million for programs, grants and projects for the STEM Action Center devoted to the areas of science, technology, engineering and math. $99,000 for a computer science and coding initiative. $10 million for the STEM Education Fund. As she was leaving Otter’s speech, Ybarra paused for a brief interview, saying she was especially pleased that the governor pledged to back her plan to reverse budget cuts by increasing discretionary spending for school districts. “It was very exciting,” Ybarra said. “(Otter) said that he was going to make education his priority, and he certainly proved that today. Overall, education spending accounts for about 48 percent of the $3.29 billion spending plan Otter unveiled. Rep. Wendy Horman, an Idaho Falls Republican who carried the public school budget in the House last year, offered early praise for Otter’s education proposals and his budget recommendations. In a briefing with reporters after his speech, Otter said his entire education proposal and funding commitments represents his effort to increase high school graduation rates. On Thursday, Otter promised he would address lagging high school graduation rates in light of a new report issued by the U.S. Department of Education. When asked what funding levels Democrats would recommend, Stennett and House Assistant Minority Leader Mat Erpelding, D-Boise, did not provide a specific amount. Instead, they said the budget should reflect 2016 needs and 2016 economic realities. Further reading: EdNews reporter Kevin Richert offers an analysis of Otter’s budget proposal and his focus on education issues. The State Board of Education has four applications in hand. The state has money to fund 10 grants. Rep. Ryan Kerby pushed the $1 million scholarship program, saying it will encourage more students to stay in Idaho for college. Ybarra succeeded in her efforts to raise teacher pay and reverse recession-era cuts, but she struck out on proposals to launch a rural schools center and increase qualifications to run for her office. The law will provide $1 million to a handful of alternative and virtual schools. Otter vetoed a costlier student mobility bill in 2015. The signing now gives legislative leaders money to try to resolve one element of the Idaho Education Network meltdown.